Quinoa-Crusted Salmon Bento, a photo by sherimiya ♥ on Flickr. I heard from a nutritionist on twitter about this method of gluten-free breading -- using cooked quinoa. What? That's what I thought too. I asked her to clarify and she said to use cooked quinoa just like panko. Hmm, okay. I decided to try making a quinoa crust on salmon for a change of pace. The quinoa didn't stick on by itself (I tried) so I dipped the fish in egg first, then in the quinoa, then shallow-fried in a pan. I used lemon and garlic to flavor it. I thought it tasted all right; nothing that spectacular. Not sure I'd try it again. The rest of this simple bento contains green beans, a little tulip shaped "flower", grapes, strawberries, and among the last of the homegrown cherry tomatoes. Looks super delicious to me, I love quinoa! Another lovely meal Sheri! Looks pretty awesome! Was the quinoa crunchy? Cool taste textures here.. I'd love this for my lunches.. Yum-my! 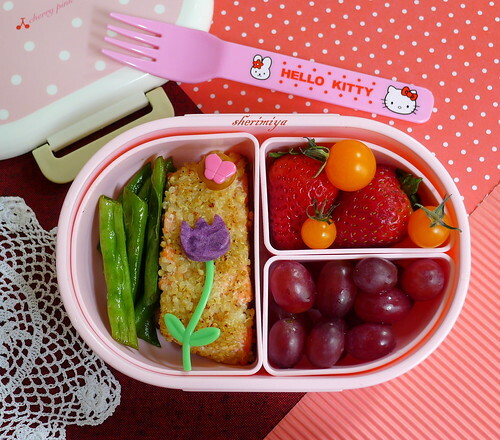 Cuuute and vibrant little bento! Loving the "tulip" detail. Happy weekend, Sheri! Thank you Bentobird! You too! 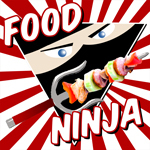 I just found your blog and absolutely love it! Just started trying to learn how to make bentos. If you have more basic recipes to put up that'd be great. Thanks for the awesome ideas!! !